Aesthetics – The Buck 112 Ranger or the Kershaw Wildcat Ridge? In this detailed head to head review, I will be comparing the Buck 112 Ranger to the Kershaw Wildcat Ridge folding knife. I will be ranking and comparing both knives on a range of different criteria, and assigning a score for each section. Before jumping into this review I recommend that you check out the Buck 112 and the Kershaw Wildcat on Amazon so you are familiar with the knives we are comparing. While Buck and Kershaw have very different histories, they were both founded with the same philosophy in mind. The Buck 112 Ranger measures 4 1/4 inches closed and weighs a hefty 5.6 ounces. It features an elegant, semi-hollow ground, 3 inch Clip Point blade made from 420HC (high carbon) stainless steel hardened to 57-59 Rockwell. Also, it features high quality brass bolsters with rounded edges and increasingly rare Macassar Ebony handle scales. Plus, since this knife was specially designed to be carried in the included, black, leather sheath, it was intentionally designed with a wide, hand-filling, grip that is as comfortable to hold as it is elegant. This knife incorporates a classic, rear, Lockback locking mechanism which was the first of its kind among commercially produced folding knives. So, what this knife lacks in fancy blade steels, sophisticated locking mechanisms, and assisted opening mechanisms, is easily compensated for by a venerable history and sheer elegance of the design. The Buck 112 Ranger retails for around the $40 mark. The Kershaw Wildcat Ridge on the other hand, measures 4.9″ closed and weighs 7.6 ounces. It features a semi-hollow ground, 3 1/2″ Clip Point blade made from 8Cr13MoV stainless steel with Rockwell Hardness of 58-60 and a classic, Lockback, locking mechanism. In addition, the Kershaw Wildcat Ridge features stainless steel liners and bolsters with cross-grooved, ABS, handle scales and it includes a heavy-duty, nylon, belt sheath. Last, the Kershaw Wildcat Ridge retails for around the $20 price tag. For me, all it takes is a single glance at both of these knives and the Buck 112 Ranger wins hands down over the Kershaw Wildcat Ridge with the single caveat that I like the longer, deeper, clip on the blade of the Kershaw Wildcat Ridge better than I do that on the Buck 112 Ranger. 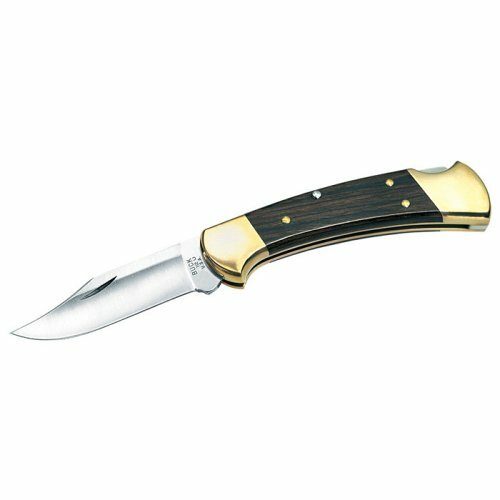 I have always loved the classic looks of the Buck model 110 and model 112 because there is something about the high quality brass bolsters combined with the Indonesian Macassar Ebony handle scales that simply shouts “ELEGANCE!! !” to me. Although I do like the Kershaw Wildcat Ridge, in my opinion, stainless steel bolsters and ABS plastic handle scales simply cannot compete with beautiful, brass, bolsters and exotic, dark, hardwood, handle scales in the aesthetics department. As a further touch of elegance, the Buck 112 is supplied with a black, leather, belt sheath while the Kershaw Wildcat Ridge is supplied with a nylon belt sheath which, once again, simply cannot compete with leather in my opinion. Therefore, when it comes to aesthetics, I find that I am inclined to rate the Buck 112 Ranger a bit higher than the Kershaw Wildcat Ridge. As I mentioned in the previous section, I happen to like the blade design of the Kershaw Wildcat Ridge better than I do that of the Buck 112 Ranger. Although both knives feature a clip Point blade design (which happens to be my favorite blade design), the blade on the Kershaw Wildcat Ridge measures 3 ½” whereas the blade on the Buck 112 Ranger measures a mere 3″ which, in my opinion, is a little bit too short for a folding knife and thus, it is better suited to a pocket knife. The slightly longer blade of the Kershaw Wildcat Ridge facilitates a longer, deeper, clip than the shorter blade on the Buck 112 Ranger which I happen to like better. That extra half inch gives the blade a slightly longer cutting edge which I find useful in many situations. On the other hand, they both feature a semi-Hollow Grind which produces a relatively strong edge bevel similar to a Saber Grind and yet, provides the deep slicing ability of a Flat Grind; thus providing the user with the best of both grinds. The main reason that I prefer the blade design of the Kershaw Wildcat Ridge over the Buck 112 Ranger is that the longer, deeper, clip on the Wildcat Ridge reminds me of the Mexican style Bowie Knife (see the Cold Steel Natchez Bowie) which is a design that I have always found to be very graceful. Consequently, because I like the longer length and the deeper clip of the Kershaw Wildcat Ridge better than I do that of the Buck 112 Ranger, I am going to rate the blade design of Kershaw knife slightly higher than the Buck. For a thorough introduction to blade steel you should read our article “Blade Steel Composition; what makes one blade steel superior to another?“. 420HC is an American-made, high-carbon, stainless steel that is generally considered to be a mid-grade blade steel because it contains 0.40 – 0.50% Carbon, 12% – 14% Chromium, 0.60% Molybdenum, 0.18% Vanadium, and 0.80 % Manganese. Therefore, it is a reasonably tough and highly corrosion resistant stainless steel that is commonly used for knives that will see hard use. However, the general consensus seems to be that this steel, as heat treated by metallurgist guru Paul Bos, holds an edge in CARTA tests even better than the 440C Buck previously used; even though it has a lower Carbon and Molybdenum content. However, this may possibly be due to the lower Manganese content and the inclusion of Vanadium which serves to refine the grain structure for a noticeably sharper cutting edge. 8Cr13MoV is a Chinese-made stainless steel equivalent to Japanese AUS-8 (aka 8A) that contains 0.80% Carbon, 13% Chromium, 0.10%, Molybdenum, 0.15% Vanadium, 0.20% Nickel, and 0.40 % Manganese. Also, despite the fact that (or perhaps because of) this steel is a Chinese blade steel, it is starting to see widespread use in American-made knives and, according to all of the reports I have read as well as my own personal experience, it seems to hold an edge slightly better that AUS-8. However, as with any blade steel, edge holding ability is solely dependent on how the steel was hardened as well as the blade geometry, the blade grind, and the bevel angle of the cutting edge. So, in looking at the composition of these two stainless blade steels, I immediately notice that 8Cr13MoV has a significantly higher Carbon content that 420HC which means that it should hold an edge better than 420HC. Also, I notice that while both steels have roughly the same amount of Chromium, 8Cr13MoV also contains 0.20% Nickel which not only serves to increase the corrosion resistance of the steel, it also increases both the strength and toughness of the steel. On the other hand, I see that 8Cr13MoV has a significantly lower Molybdenum content than 420HC which would make it less abrasion resistant because Molybdenum combines with Chromium during the forging process to form hard, double-carbide, bonds. In addition, I see that both steels contain roughly the same amount of Vanadium which serves to refine the grain structure of the steel which enables it to be honed to a finer edge that blade steels that do not contain Vanadium. Last, I see that 8Cr13MoV contains only half as much Manganese as 420HC which serves to make the steel tougher but, also increases the size of the grain structure. Last, I see that the blade of the Buck 112 Ranger (420HC) is hardened to 57-59 Rockwell whereas the blade of the Kershaw Wildcat Ridge (8Cr13MoV) is hardened to 58-60 Rockwell. So, all things considered, I am inclined to rate the 8Cr13MoV stainless steel slightly higher than the 420HC although, they are both excellent blade steels for every day carry knives because they are both reasonably tough, highly corrosion resistant, and will hold an edge very well but are not as difficult to sharpen as blade steels such as 154CM, ATS34, or D2. The handle scales of the Buck 112 Ranger are made from an increasingly rare, exotic, Indonesian, hardwood called Macassar Ebony which is a species of flowering tree in the family Ebenaceae that is endemic to the island of Sulawesi in Indonesia. Its common name is derived from the main seaport on the island. Since Makassar Ebony has been a popular wood for centuries, the majority of the existing trees have been felled and used in high quality furniture. Because this exceptionally beautiful species of ebony has been avidly sought by wood workers all over the world over the past two centuries, it has now become very scarce and thus, this scarcity has led to very high prices. In fact, Makassar Ebony is now one of the highest priced timbers in the world! “Acrylonitrile butadiene styrene (ABS) is a common thermoplastic. Its glass transition temperature is a approximately 105˚ C (221˚ F). ABS is amorphous and therefore has no true melting point. Thus, a translation of all of that for us laymen is that ABS is a tough plastic that it well suited for knife handle scales. So, how do I rate these two handle materials? Well, on the one hand, we have a rare, expensive, exotic, hardwood and on the other hand, we have a tough-as-nails plastic. While the Macassar Ebony is far more aesthetically pleasing to me than the ABS plastic, it clearly is nowhere near as tough a material as ABS plastic. But, since both materials are protected on either end by metal bolsters, I am not certain that toughness is a particularly valuable trait in the case of these two knives. Therefore, I am going to rate the Macassar Ebony over the ABS plastic simply because it is far more rare and expensive and, in my opinion, far prettier. Concerning locking mechanisms, both the Buck 112 Ranger and the Kershaw Wildcat Ridge feature the venerable and dependable Lockback locking mechanism, which consists of a lever that is pinned in the center of the liners such that it pivots on the pin and then, either a leaf spring or a coil spring is placed underneath the rear end of the lever to provide positive pressure. Consequently, as the knife's blade is rotated into the open position, the end of the locking lever slides around the end of the blade's tang and then drops into a notch milled into the side of the tang; thus locking it in place. While this is not a particularly sophisticated locking mechanism by today's standards, it is both functional and dependable and thus, it does serve to prevent the knife's blade from accidentally closing on the user's fingers although, it does require the user to use two hands to unlock and close the knife. 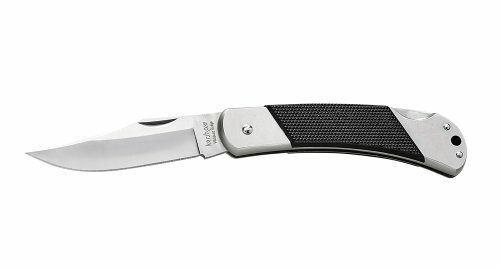 Since both the Buck 112 Ranger and the Kershaw Wildcat Ridge feature the same locking mechanism, I am inclined to give both knives the same rating here although, I am not going to give either one a particularly high rating because there are numerous, more sophisticated, locking mechanism on the market today. * Due to fluctuations in the market, and special discounts – you should check the prices of both knives on Amazon to see the most up to date price. View the Buck 112 and the Kershaw Wildcat on Amazon to check the latest prices. When it comes to weighing the value of these two knives, is seems obvious to me that the Buck 112 Ranger is the better value for the money. The reason for my opinion on this matter is that both knives feature blade steels that are roughly equal to each other but, the Buck 112 Ranger features much more expensive handle scales and a leather belt sheath as opposed to inexpensive plastic handle scales a nylon belt sheath. In addition, given the fact that the Buck 112 Ranger has retail price of $40 whereas the Kershaw Wildcat Ridge has a retail price of $20, I am quite frankly very surprised by the minor difference in price; especially since the Buck 112 Ranger is manufactured in America and the Kershaw Wildcat Ridge is manufactured in China. Therefore, I am inclined to consider the Buck 112 Ranger a MUCH better value for the money than the Kershaw Wildcat Ridge. There again, the choice here is obvious to me. Thus, while I do like the Kershaw Wildcat Ridge and I do believe that it is a well designed and well constructed knife, it simply cannot compete with the Buck 112 Ranger in my opinion without a significant upgrade in blade steel or handle materials or both. So, although I do like the longer blade length of the Kershaw Wildcat Ridge as well as the Mexican style Bowie blade, when I consider the other factors, I have to say that I like the Buck 112 Ranger better because it is both a prettier knife and a better value for the money. Therefore, my vote in this category goes to the Buck 112 Ranger. Last, in adding up the numbers, I see that these two knives have run a fairly close race but, the Buck 112 definitely tops the Kershaw Wildcat Ridge on the Folding Knife HQ ranking chart. Blade Steel Composition; what makes one blade steel superior to another?